The Gentlemen's Monthly: Spotlight RA. A good rector will tell you the real secret to a great Notre Dame residence hall is its staff- the resident assistants (RAs). And for St. Edward's, it is no different. These dedicated, undergraduate seniors are to the Hall as caffeine is to a Monday morning… indispensable. Who are these seniors? Let's put the spotlight on one of them... the 2nd floor resident assistant, recreational volleyball player, avid Star Wars Battlefront II player, aspiring doctor, and Washington State native, Charles “Charlie” Rutherford. St.Ed: Why did you become an resident assistant (RA) for your senior year? As a senior, you should be kicking it into neutral, coasting across the graduation line in your pjs. 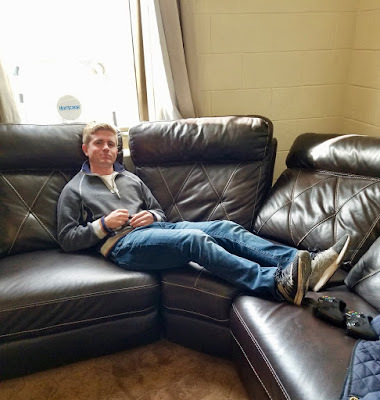 Rutherford: I thought how well my previous RAs knew their residents was awesome, and I wanted to stay involved in the Hall as much as I could. St. Ed: Many times those who live on the second floor feel like they have lost out in the lottery called life… and in a certain way, yes, they have. How can you not feel that way? You can’t legitimately use the elevator, and so, it’s always the steps? Still, how do you make your residents feel that they and the floor aren’t room lottery losers? Rutherford: I think that our section is really tightly knit, and also since everyone uses the Greg, it is really easy to just go in there and chat with everyone. It almost has the feeling of a group of rooms with a massive common room where people can go to be social. Okay, I’ll say it… the Greg belongs to the second floor, literally and figuratively. St.Ed: Rumor has it that you are an the you are a medic. Is that true? Do you have a prescription pad? Rutherford: I am an EMT, and have been since my freshman year. Unfortunately, haven't earned the prescription pad rights yet, but am working on it! St.Ed: Being an RA for over a two weeks now, what’s something that you learned about the Hall? Rutherford: I've learned that being Hall Staff in St. Eds is really fun and that everyone intregrates into the community within a week or so. It was really interesting to see both of our new ARs and all of the new freshmen in for the Hall within the first few weeks... it was like the first day of school... everything was new for them. St.Ed: What would you want your legacy to be at Steds? Rutherford: I want to be remembered as always an available RA, willing to chat about anything at any time… and could tell you if you had broken a bone.